MC-100V Indutherm Casting Machine Common Process for Melting The high demand for our MC 15+ and VTC 200 V high-temperature tilting casting machines motivated us to develop the MC 100 V: a number of users wanted the compactness of the MC 15+, but needed greater capacity – not so much, however, as the VTC 200 V offers. We have filled this gap with the new MC 100 V, by developing a small, hi-tech machine that combines the best of both models: it builds on the space- saving design and ingenious pivoting mechanism of the small MC 15+, while offering a wide range of the highlights from the much larger VTC machine.Overview MC 100 VThe new 2,000°C MC 100 V tabletop casting machine: cutting-edge technology in the most compact space. 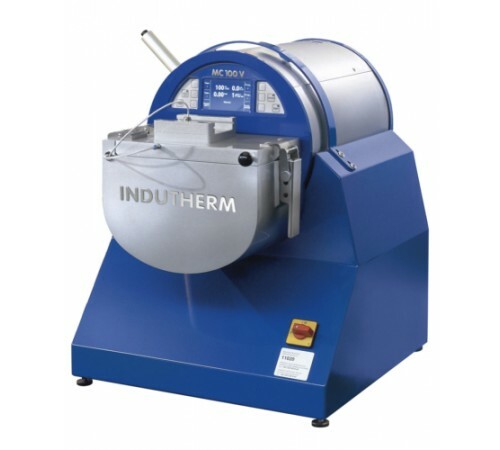 Very easy and safe to use, short implementation time Excellent price-performance ratio 8 kW induction generator for quickly reaching the molten temperature Thorough through-mixing of molten metals using low-frequency induction tuning Melting under vacuum or inert gas to prevent oxidation Top quality form filling using overpressure of up to 3 bars (casting under vacuum also possible)Economical consumablesLatest generation generators The MC 100 V is equipped with a latest generation induction generator, developed especially for this housing design and with high operating efficiency. Convenient, high precision control is provided via a new opera- ting system, with an LCD display, full text display and program control. Using vibration when casting ensures better form filling, creating casts with greater, more consistent densities, higher elasticity and greatly reduced porosity. Vibration technology is a compelling alternative to the frequently used and relatively delicate centrifugal systems, especially when casting platinum or palladium.Technical Details: performance performance max. / electrical connection 8 kW 3x400 V maximum temperature 2000° C capacity crucible volume 450 g Au 18 ct 250 g steel/500 g Pt for use of flasks up to bis ø 80/100 mm x 120 mm H handling+control control panel LCD-Display, full text display vacuum or overpressure after casting -1 up to +3 bar temperature measurement/control up to 2.000° C accessories vacuum pump (min. 21 m3/h) .. The high demand for our MC 15+ and VTC 200 V high-temperature tilting casting machines motivated us to develop the MC 100 V: a number of users wanted the compactness of the MC 15+, but needed greater capacity – not so much, however, as the VTC 200 V offers. We have filled this gap with the new MC 100 V, by developing a small, hi-tech machine that combines the best of both models: it builds on the space- saving design and ingenious pivoting mechanism of the small MC 15+, while offering a wide range of the highlights from the much larger VTC machine. The MC 100 V is equipped with a latest generation induction generator, developed especially for this housing design and with high operating efficiency. Convenient, high precision control is provided via a new opera- ting system, with an LCD display, full text display and program control. Using vibration when casting ensures better form filling, creating casts with greater, more consistent densities, higher elasticity and greatly reduced porosity. Vibration technology is a compelling alternative to the frequently used and relatively delicate centrifugal systems, especially when casting platinum or palladium.